We’re on the road in France and Spain at the minute, but here’s one we did earlier……. 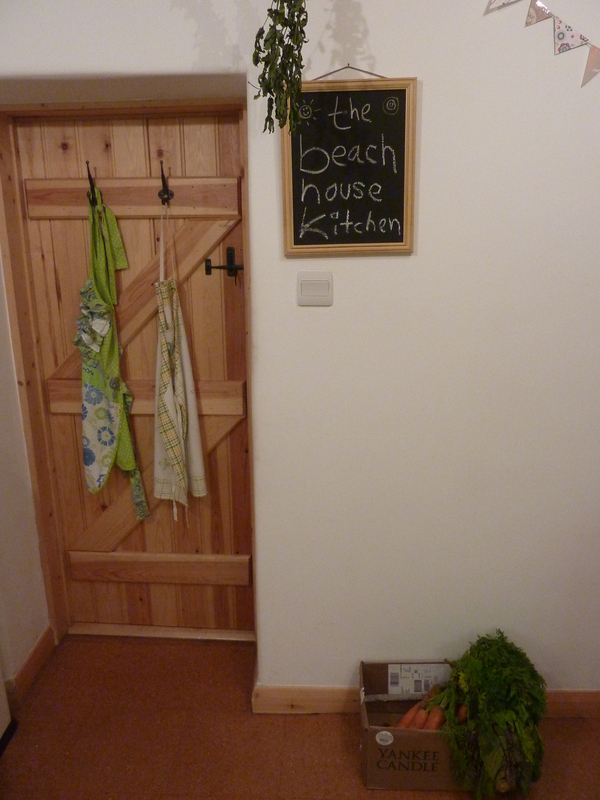 We have some lovely friends of the Beach House Kitchen to thank for these nuts, Rachel and Axel over on Anglesey, who somehow man-handled their monkey puzzle tree into letting go of its precious nuts. Not an easy task, these trees are seriously covered in sharp spines. We saw this technique being executed by the British wild food guru Hugh Fearnley-Whittingstall on his TV programme ‘Veg Everyday’ recently and he needed the help of a tree expert and a hydraulic lift. From what Rach tells me Axel simply shimmied up a neighbouring tree and shook the hell out of the top, using only a snake catching pole (Axel is an expert in all things snakes and adders) and net. Unconventional harvesting techniques demand an unconventional recipe me thought. Hugh made a tasty looking summer cous cous salad out of his puzzle nuts, but we were on a different page all together. 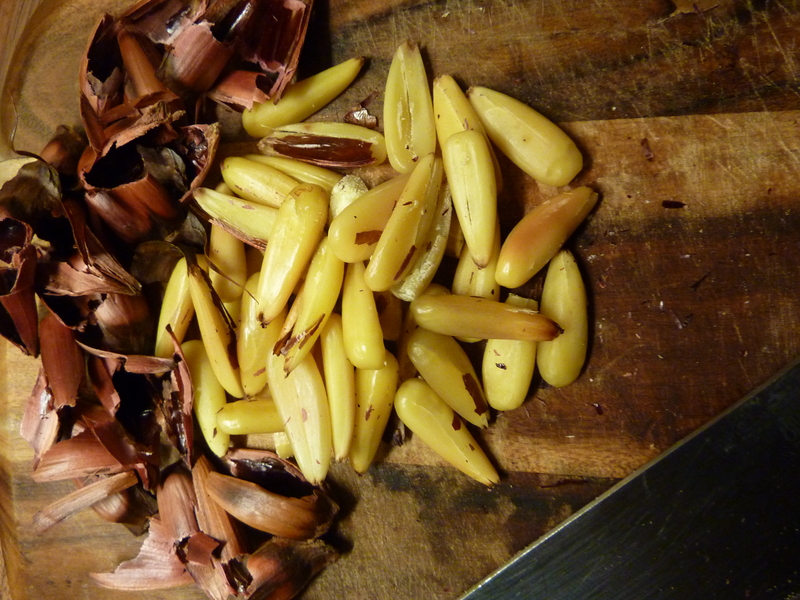 So I had a bowl of these beauties, I roasted them and tried one, tastes a little like a chestnut merged with a pine nut. 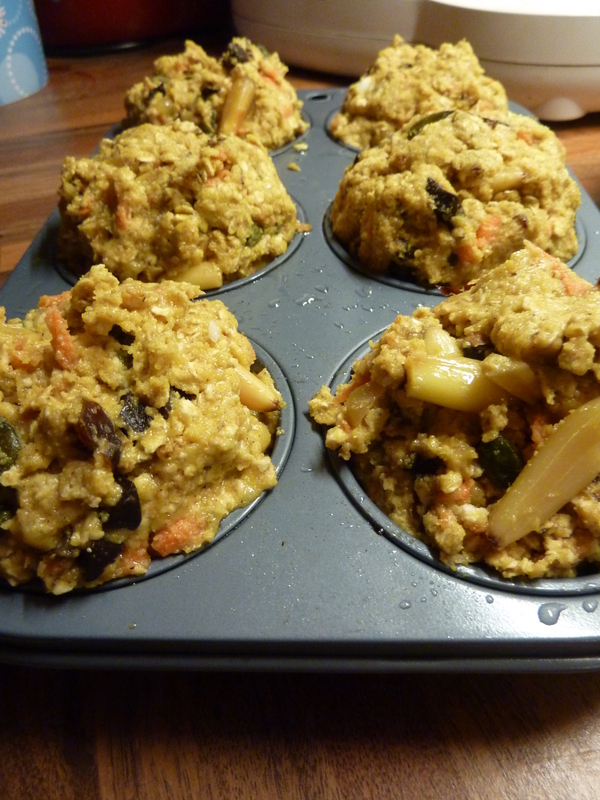 They are probably best just eaten as they are, but I couldn’t resist sticking them in this vegan muffin recipe that I’ve been sitting on for a while. A word of gentle warning, these nuts do go a bit dry after roasting and when baked. CRUNCH! Jane has been fantasising about cake now for a few days and I have finally got around to making my poor, long suffering lady something resembling a sweet thing. This is as close as I get really, all that white flower, butter and sugar makes me feel a little queasy. These muffins are packed with the good stuff and still taste mighty fine. What on earth is a Monkey Puzzle Nut? The monkey puzzle tree (or Araucaria araucana if you’re Latin speaker) is an evergreen that can grow up to 40 metres tall with a trunk of two metres wide! The tree is covered with sharp, blade-like, ‘reptilian’ leaves or spines that make the monkey puzzle nut one of natures toughest morsels to harvest. The tree is native to the low Andean slopes of Chile and Argentina but seems to do well on this little grey island. It is a hardy conifer and you regularly see them sticking out of gardens and stately home driveways. I don’t think there is a more incongruous tree on this island than the monkey puzzle. What on earth is Jaggery? Jaggery is an unrefined sugar used in many parts of the world, known as Gud in India. It has an amazing toffee-like texture and can be made with palm, coconut or date tree sap. Jaggery has a powerful, caramelised flavour that sets it apart from any sugar I have come across. It is high is sucrose and can be used as a healthier alternative to refined sugar. Great in a chai. I like to bake with it because it flavours and sweetens. You could use a good unrefined brown sugar as a substitute, or even something like molasses, as jaggery can be a little hard to track down. These muffins make for a great breakfast (they are nice and dense) and are best served warmed through. 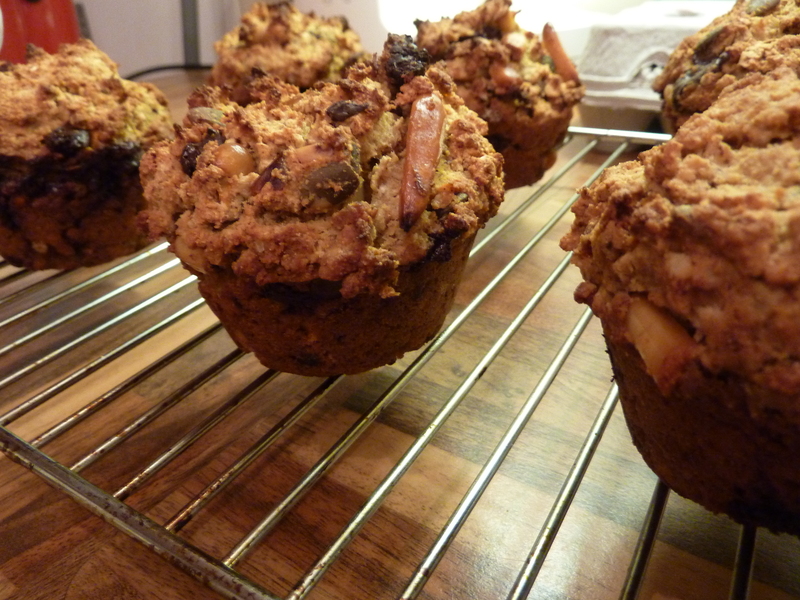 A cold muffin has an air of austerity to it that a baked good should not possess. If you are storing them, make sure they are in a well sealed container or well cling filmed, they can get a little dry these vegan sorts. I used polenta and oats here as they were in the cupboard, another flour like spelt, rye or tapioca will work really well. Polenta isn’t quite fine enough to bind and bake as well as other flours. 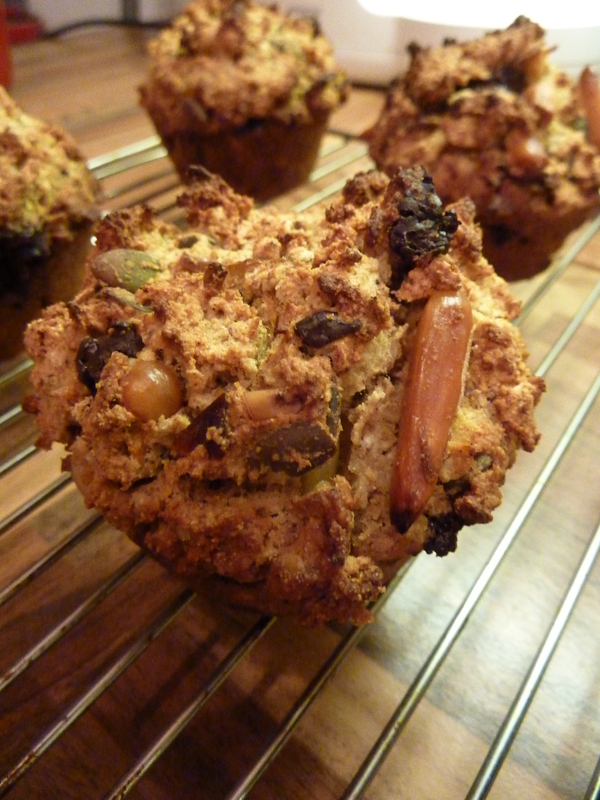 The oats add alot of ballast and ‘feel’ to these wonder muffs. Makes for six hearty muffs. Preheat your oven to 375ºF and grease six muffin cups (or use silicon muffin cups). 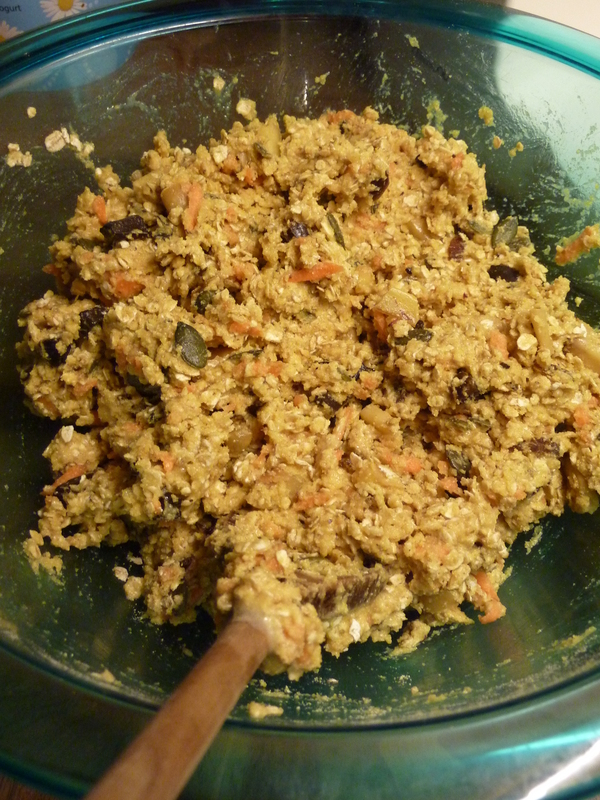 In a bowl, mix with vigour the polenta, oats, cinnamon, baking powder, baking soda, and salt. In a food processor, blitz together the banana, coco oil, jaggery and vanilla until relatively smooth with just some small banana lumps remaining. 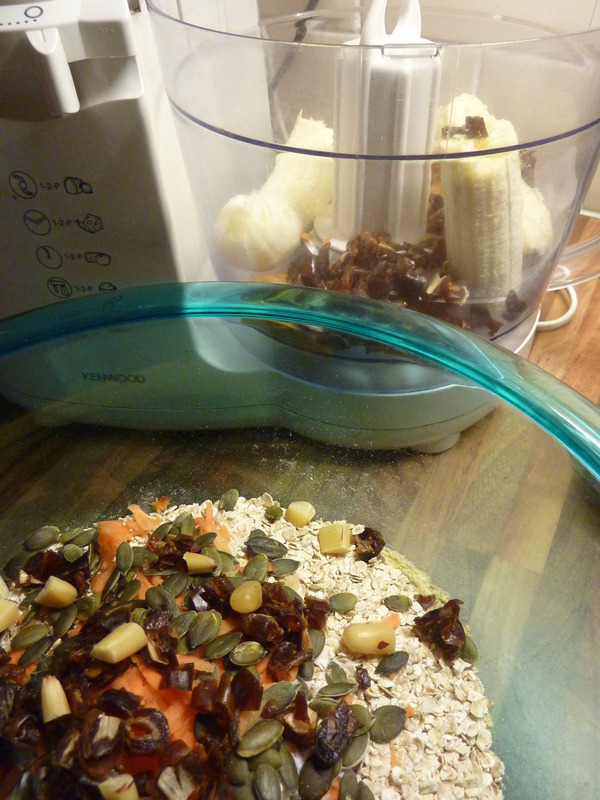 Add wet mix to dry and add carrot, chocolate, seeds and milk. Fold and stir together nicely until just combine. Divide the batter up between the six muffin cups, and bake for 25 to 30 minutes, or until slightly browned on top and a thin knife inserted into the center of a muffin comes out clean. With a cup of fine tea. Best warm from the oven, but great in a packed lunch too. Simply put, we know of no cooler muff. Jaggery is unrefined and a more complex carbohydrate than normal white sugar. It contains magnesium and salts and good levels of the antioxidant selenium. Jaggery also contains iron, which helps ease tension. What a magical idea. Muffins for the future…..